We haven’t had a company related blog in a while but we thought it would be a good time to update people on all the positive Noxster reviews, accolades and projects we are in the midst of. This blog will be one of many regarding non SEO related work that we have been doing. As we continue to grow we are working on more and more creative projects outside the realm of SEO and web design solutions. On Friday we released a press release for the launch of ISG’s new website. Our creative team built the website on word press and integrated a ton of great tools that are different from the everyday websites. ISG is an international wealth management company that helps individuals and companies accumulate wealth. We are now working on their real estate database and have partnered with them to do their search engine optimization campaign. We are and have never been just your traditional SEO Company. We are able to offer so many outside the box solutions that ISG is taking full advantage of. 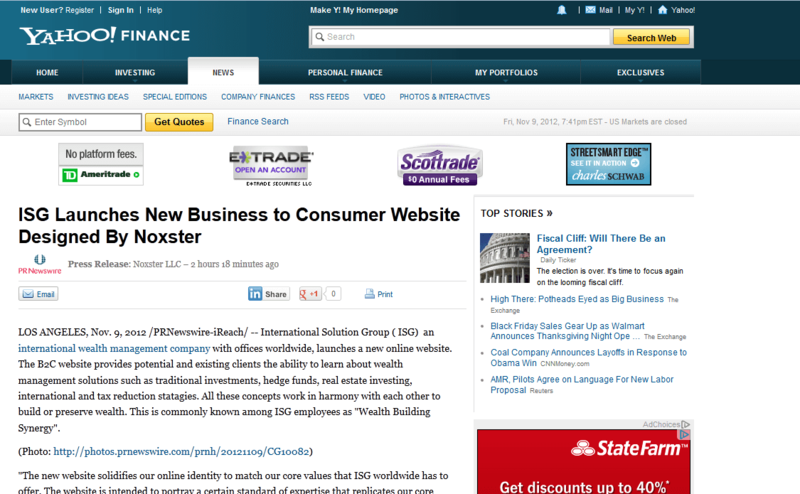 Click here to read the full Noxster Press Release in the Yahoo Finance section. The press release was picked up by over 146 business journals worldwide. We are so proud of our creative and web design team for putting together such an amazing site and the work they have done. To check out our full Portfolio of web design work you can visit www.noxsterwebdesign.com.